We are still on our wonderful winter road trip (2011), but I continue the hunt for wines to serve guests at our Cape Cod Bed and Breakfast when we return to Sandwich. As we wander about, we love to reconnect with old friends and often make new ones. Most of these wonderful occasions involve wine, surprise! We spent the last few weeks in a lovely new RV park in Freeport, Fl., Live Oak Landing, on the banks of the Black Creek that flows into the Choctawhatchee Bay. The Park is only a few miles from where Jan grew up and, in fact, is located on the site of a fish camp where Jan’s grandfather kept a boat and often took her fishing. A childhood friend of Jan’s, Nancy and husband Frank, live only a mile from here. Nancy loves wine as much as we do and we sampled some wines together over our stay. Each wine was tasted on a different occasion, but warmly enjoyed with Jan’s old friend and some of the wines may soon make their way to our guest at the Inn. On our first night in Freeport, we shared a very nice bottle of 2009 Meiomi Pinot Noir. I had the 2008 vintage in Sandwich last year and was happy to find the 2009 and share with our Florida friends at our picnic table. 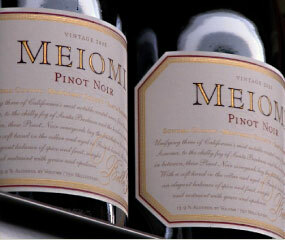 Meiomi is unique in that it is a blend of selected grapes from Sonoma County 47%, Santa Barbara Count 34%, and Monterey County 19%. The name Meiomi (May-OH-mee) is descriptive of the blend as it means ‘coast’ in a Native American Indian language and the grapes are all sourced from coastal vineyards. The winemaker, Joseph Wagner, pulls off the trick of blending grapes with distinct characteristics into a great food friendly wine. This is no surprise, when you understand he is part of the Wagner Family that started Caymus and Belle Goss, two famous California wineries. I found the Meiomi at Chan’s Wine World in Sandestin, Fl., a shop that Nancy recommended to me last year. They have an extensive selection of wines and cheeses and a very knowledgeable staff, who suggested the next wine we tasted. 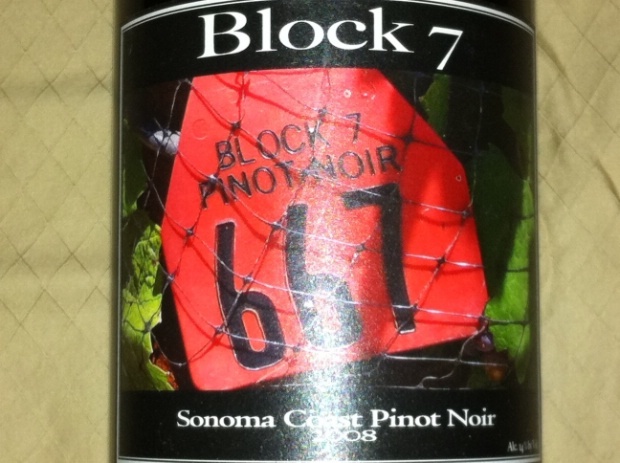 We stayed with pinots and shared a 2008 Block 7 Sonoma Coast Pinot Noir. We enjoyed this easy drinking wine with humus and crostini on Nancy’s porch. I had never heard of Block 7 and after a little research I learned it was made by Deerfield Ranch Vineyards in Kenwood, Ca exclusively for Chan’s Wine World. Since only 360 cases were made it is no wonder I have never seen it before and unfortunately we will never find it in Sandwich to serve to our guests. Oh well, at least we had the pleasure of it one time. The last time we did our RV Park tasting, it was around the fire pit overlooking the Black Creek. 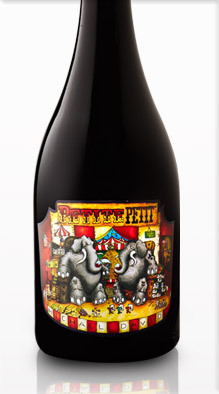 I was excited to share a 2007 Petite Petit from the Michael David Winery in the Lodi Appellation of California. I first discovered this great blend of Petite Sirah and Petit Verdot on our way home last year in a cute wine bar in Ashville, NC. I wrote about in one of my first wine blogs and have not been able to find it since. The funny thing is I found it at the Publix’s grocery store. In Florida, food stores sell beer and wine and usually have a predictable and limited offering. The Petite Petit’s label, with it colorful dancing elephants, all but jumped of the shelf at me. It was like seeing an old friend. Our first stay at the new RV park was made more enjoyable by sharing wine with friends. 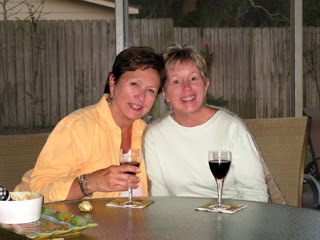 We had ‘wine picnic table’, ‘wine porch’, and ‘wine fire pit’ and a great time.